Part II is still in progress. I also have an original story of my own called Symphony of Sol: I Shall Not Rest in Peace. 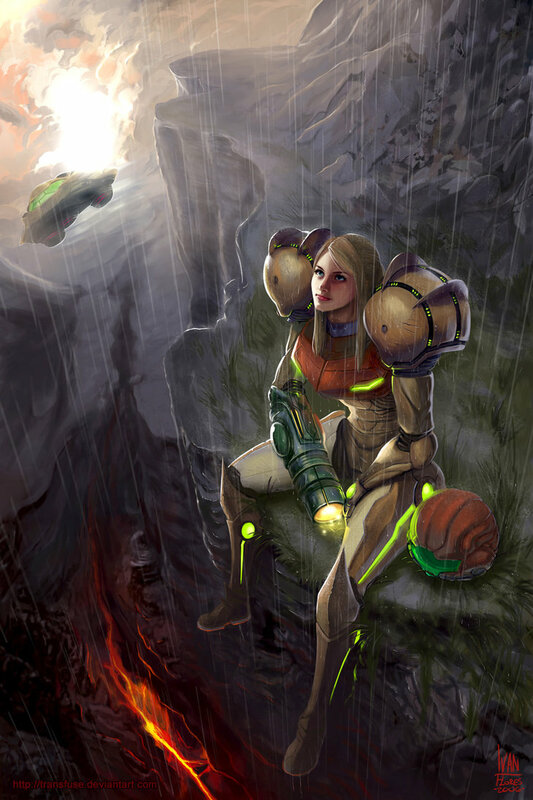 Metroid Origins is an imaginative retelling of how Samus Aran became a feared bounty hunter. It also traces the origins of her love interest Adam, and her hated archnemesis Meta Ridley. This is a fan-fiction. I take certain liberties with Samus story. I spend a bit of time on her upbringing by the Chozo, it is an origin story after all. This means that there is a considerable amount of time before she receives her power suit. This was done to develop her as a person. It isn’t the suit that makers her the interesting woman she is, but rather the person beneath that is so fascinating to behold. Imagine yourself in her shoes, parents murdered by pirates, raised by a fierce, bird-like race… how would you develop? This is the story I wish to expound upon. The original game Metroid was influenced by the movie Alien. It set a brooding lonely tone which I capitalize on here. This is not a kid’s tale. If a movie were made out of it , it would be rated R for gruesome realistic descriptions of war and hunting. There are no sexual scenes. There are many gaps to her story. I have filled these gaps with some novel ideas of my own. The major differences you will see are, A) the Chozo can fly, B) Samus Aran must earn her name, C) the Varia Suit that Samus is most known for wearing was not made by the Chozo. This is a companion story that fits very nicely with the games. It does not fit well with any other medium of the tale. My goal is to tell a well-written story influenced by the games they surround. And now for the disclaimer. The story is not affiliated with Nintendo in any way, nor is it meant as a definitive companion to the manga. I do share many of the ideas there, but it is my personal take on the story from a fans perspective, written for fellow fans to enjoy. The art displayed at the beginning and end of each chapter is fan art that I have found around the internet. There has been no collaboration between me and the artists. They have simply been as intrigued with the character of Samus, as much, if not more so, than I have. The only exception to this is the first picture displayed in the prologue. It was done by the official concept artist for Retro Studies Andrew Jones. Highly recommend you give his sight a click. You will not be disappointed. I am in the process of contacting all the artists so that I might have their permission in continuing to display their art. Transfuse, 3ihard, and Crimson VVings have answered my requests with the positive. If you wish to view more works of a particular artist, click on the link I have provided beneath the displayed work. Any art buffs out there should check them out. You will not regret a peruse through such gifted artwork. Love the work thus far! I’m woking on compiling it into a pdf. Not to sound impatient, but how is part II coming? Any idea when we can expect to see the next installment? Thanks for reading. Glad you enjoyed the story. Right now I’m busy working on the second episode of my own Sci-fi series Void Voyage. I do have ideas for the second part of Metroid Origins. Maybe I’ll start putting it together, if there is enough interest in it that is. So I guess I’m saying, spread the word. The more comments I get on here, the more inclined I will be to work on Metroid Origins part 2. If you like my writing, here’s a link to my Void Voyage story. i would love to see the next installment of the story online. i actually became a gamer fan, because of the metroid series. i think it is a good story, and i would love to read more of it when the nextg part is posted. Thanks Douglas! Metroid is a fantastic series! I got into it later with the Prime video games, but I have so much love for the characters and story. I do have some half-written bits for another batch of stories. If I get enough traffic I’ll finish them up! Tell your friends.